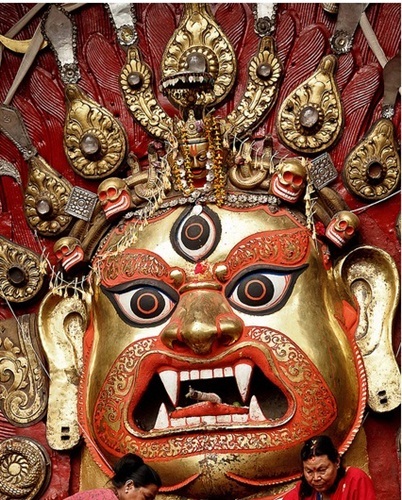 Indra Jatra is one of the biggest religious street festivals in Kathmandu. 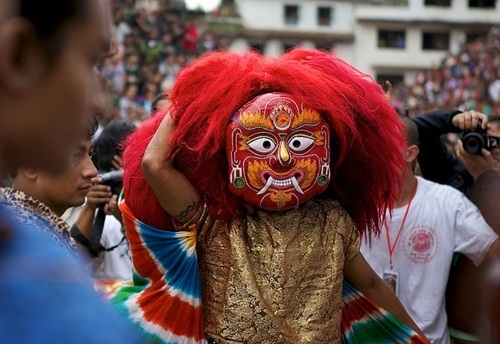 The festival of Indra Jatra takes place in September each year and heralds the end of the monsoon season. It is primarily in honour of the rain god, Indra. It is also known as Yenyā in Newari/Nepal Bhasa. 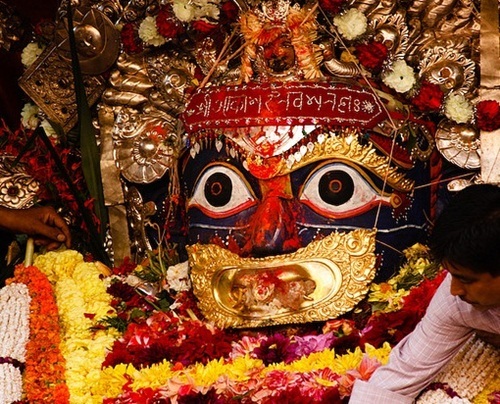 The 8 day long Indra Jatra Festival begins on the 12th day (Dwadasi) of the bright half (Shukla Pakshya) of the lunar month Bhadra and concludes on the 4th day ( Chaturthi) of the dark fortnight of lunar month Ashwin but the most important day is the 3rd day when the procession of Kumari -the Living Goddess and other deities are taken out. According to an ancient legend, the young Indra, disguised as a farmer, descended to earth in search of Parijat, a white flower, his mother, Dagini, needed to perform a ritual. He found the Parijat, but was caught while trying to take the flower by the owner of the meadow where he found the flowers. He was bound and imprisoned in Kathmandu until his mother, worried about his extended absence, came looking for him. When the city folk realized who they had imprisoned, they agreed to release Indra but on the condition that he would return to the earth every year during that time and be displayed as a prisoner for 7 days and that he would provide enough rain (dew during winter) for the crops. So, during this festival, images of Lord Indra are displayed for 7 days, but in captivity. Dagini promises enough dew throughout the winter to ensure a rich crop and to take back with her to heaven all those who had died in the past year. The Indra Jatra festival thus honours the recently deceased and pays homage to Indra and Dagini for the coming harvests. People from all over Nepal, mostly those who live within the Kathmandu Valley, gather at Hanuman Dhoka in Kathmandu. The first day of the festival is viewed by a large number of people. It begins when a huge, carefully selected pole, carried via Tundikhel (Kathmandu’s parade ground), is erected outside the Hanuman Dhoka in Kathmandu. A flag of Lord Indra is tied at the apex of the pole. A young male goat is sacrificed to the forest deity before the tree is brought down to carve the pole. The giant facade of Aakash Bhairab, which remains hidden behind the caged bar throughout the year, is opened today for the next three days. Local Newari ethnics pour the home brewed beer into the mouth of Bhairab and people compete to get a sip when the drink spouts out. 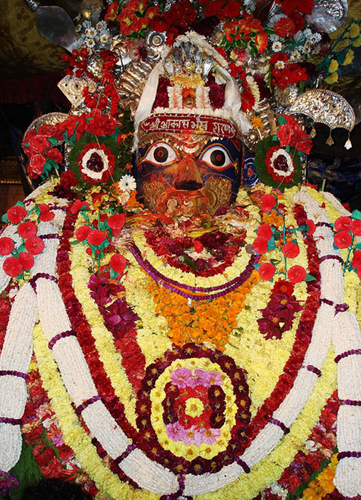 People display the images of Lord Indra and make sacrifices of goats and roosters. There is a brief dances during the pole erecting ceremony. 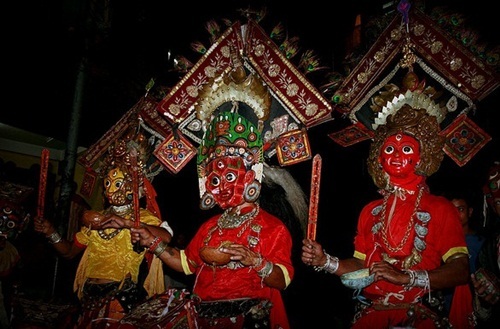 Classical dancers also assemble at the spot, wearing different kinds of traditional masks and costumes and dancing around the courtyard of Hanuman Dhoka to celebrate Indra’s visit. 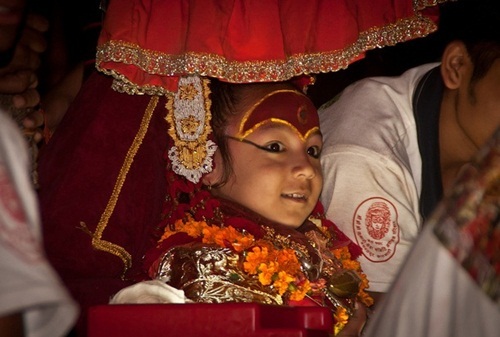 On the third day of the festival of Indra Jatra, the living goddess Kumari is taken out in a procession in a chariot. Kumari – the Living Goddess of Nepal comes out from the seclusion of her residence and tours the city on a temple chariot. Along with Kumari, other deities like Ganesh – the elephant headed God, and Bhairav are also paraded throughout the city. Kumari is greeted from the balcony of the old palace by the president. The procession then continues out of Durbar Square towards Hanuman Dhoka where it stops in front of the huge Seto Bhairab mask. The Kumari greets the image of Bhairab and then, with loud musical accompaniment, beer starts to pour from Bhairab’s mouth! Getting a sip of this beer is guaranteed to bring good fortune, but one lucky individual will also get the small fish that has been put into the beer – this is said to bring even more good luck. Numerous other processions also take place around the town until the final day when the great pole is lowered and carried down to the river. This entry was posted in Nepal, Nepali Culture, Nepali Festivals and tagged Chaturthi, god of rain, Indra, Kumari -the Living Goddess, Yenyā. Bookmark the permalink. It was so pitty, because I tought the kumari is comming on friday and we were in Basantapur, but ther we have come to know she is comming on saturthay and so we was to early. 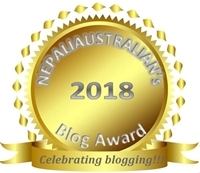 and on saturday we ( afriend from german) and me starded our trip to chitwan………..so I hope for next year………..
That is a big bummer but I am sure you can visit Kathmandu’s Kumari in Dashian as well. Just check in Hanuman Dhoka. Have a great time in Chitwan. Wow! I like how the humans made demands of Indra – an accomodating deity, there. It’s also interesting to me to hear that the Judeo-Christian tradition isn’t the only one in which animals are sacrificed. I don’t like it in any case, but I don’t make the rules! This festival is nothing compare to Dashain (biggest Hindu festival in Nepal like Christmas for Christians) and they scarifies 1000s of buffaloes, goats, chicken and ducks. I don’t like that part of it either but that is the tradition in Nepal. Nepal is such a festive place, and that reflects a certain spirit. So interesting. Interesting, and definitely very colorful. It is such a fun time in Kathmandu. So many people and so many activities ..